The following essay is adapted from a lecture given by Prof Shane O'Dea to the Newfoundland Historical Society on September 23, 1982. There is a marked distinction in the architecture of religious buildings in Newfoundland, a distinction determined at first by period and then by denomination. The earliest churches, built before 1846, tended to be similar to each other, and essentially primitive or at least simple. In the 1840s the cathedrals of both the Roman Catholic and the Anglican churches were begun in the capital, and these had a significant effect on churches later constructed by these denominations. 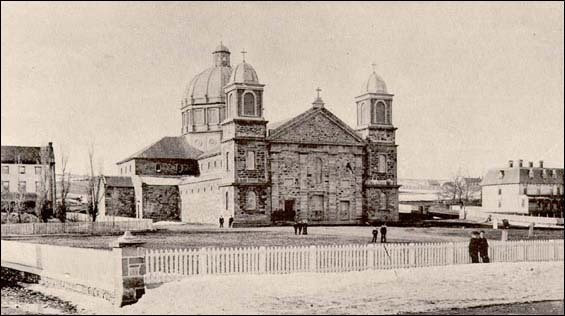 In consequence, when looking at Newfoundland's religious architecture, one is looking at an early period that runs from 1662 to 1800, followed by a span of limited development (1800-1846), then by a interval of cathedral building, and finally by a period when these cathedrals influenced other construction. This essay focuses on the latter two phases of church architectural development. The Anglican Church was inspired by Gothic Revival architecture. Photo by Duleepa Wijayawardhana. Reproduced by permission of the Newfoundland and Labrador Heritage Web Site Project ©1998. The churches built before 1820 tended to be rudimentary buildings, lacking towers, steeples and chancels, and were almost indistinguishable from local fish stores. Distinctions began to develop when the two major denominations - Anglican and Roman Catholic - began to build their respective cathedrals. The Roman Catholic community built their cathedral as a Romanesque Revival structure. The Anglicans, led by Bishop Edward Feild, were influenced by the Gothic Revival. 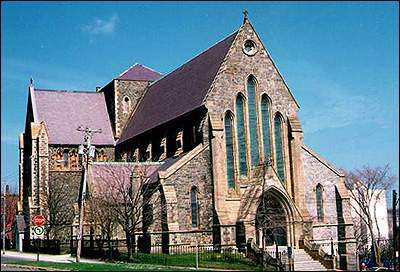 In an effort to establish and promote the use of Gothic Revival architecture in Newfoundland, Bishop Feild commissioned the distinguished British architect Sir Gilbert Scott to design the Anglican Cathedral. He also brought over William Grey as principal of Queen's College, and made him diocesan architect. Grey designed numerous wooden Anglican churches in rural Newfoundland that combined local materials and craftsmanship to create models for other clergymen to follow. 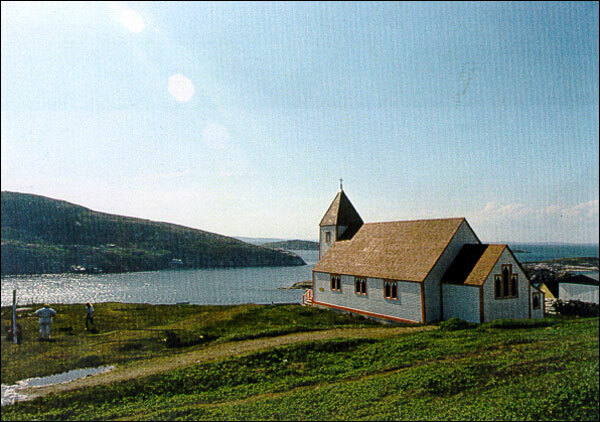 The last surviving church designed by Grey is St. James Anglican church at Battle Harbour, Labrador. Completed in 1857, St. James is typical of Anglican mission churches built throughout Newfoundland in the 19th century. Reproduced by permission of the Heritage Foundation of Newfoundland and Labrador ©1998. Although Grey left Newfoundland in 1857 and Bishop Feild died in 1876 their architectural influence carried on. The Gothic Revival remained the definitive Anglican style until after the First World War. In 1892 the congregation in Trinity borrowed a design from Nova Scotia and built the finest surviving Anglican Church in Newfoundland. The Catholic churches built in the latter half of the 19th and early 20th century do not show the same commitment to one architectural style. J. J. McCarthy of Dublin designed St. Patrick's, one of the earliest Catholic churches planned after the Cathedral, in the Gothic style. McCarthy was an associate of a leading figure in the English Gothic Revival movement, A. W. N. Pugin. The design for St. Patrick's appears to have been inspired by Pugin's design for St. Mary's in Killarney, Ireland. For Newfoundland Catholics, Renaissance or classical models came to dominate. The greatest of these was the cathedral at Harbour Grace. Begun in the 1860s under Bishop Dalton and pursued by his successor, Bishop Carfagnini, it was modelled after St. Peter's in Rome. Finished in 1884, it was destroyed by fire in 1889. Cathedral of Immaculate Conception, Harbour Grace, nd. Catholic churches were modelled after Renaissance or classical architectural designs. Unknown photographer. From Moses M. Harvey, Newfoundland illustrated: “the sportsman's paradise. ” Concord, N. H.: T.W. & J.F. Cragg, 1894, p. 91. In the twentieth century, renaissance forms have been used more readily in the construction of Catholic churches. This reflects the religious and cultural connection between Catholicism and Rome, and possibly, a desire to distinguish itself from Anglicanism.